Marks and Spencer...now I know what everyone is thinking 'old people'. Yes for the most part Mark and Spencer is known for being a place where little old ladies shop, at least it is where I live. I don't think many of my friends ever step foot in there unless its for the yummy food. Now for any international readers I don't think Marks and Spencer exists anywhere else (correct me if i'm wrong), they do deliver internationally but it comes at a price. Anyway as I was saying not a typical store for younger people, however I sometimes have a wander in there just to see what's on offer and well I came across these this morning. These M&S's Natures Extracts shower gels, and at the moment all the Natures Extracts products are buy one get one half price. However that is not the best part, these products are ridiculously cheap but smell amazing. These shower gels are £2 for 250ml so togther they cost £3. 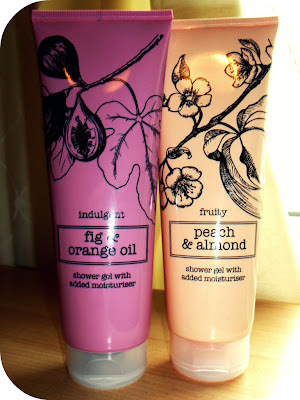 I think that's a bargain, and they smell really nice, I like the Peach and Almond scent the best as it's quite a calming smell, nice for an evening shower. The Fig and Orange is bit more fruity and invigorating I think, probably due to the orange oil. Also I like the packing each scent has a different colour which is carried through the whole range which is really nice, and I like the floral patterns. The most expensive products in the range are only £2.50 which are the Body Butters and the Bath Foams, so you really can't go wrong. I'd definitely recommend having a browse if you're near an M&S in the next few days! 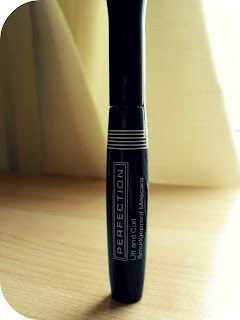 Another M&S find was this Lift and Curl Smudgeproof Mascara from their Perfection collection. I've been using the Lash Extend and Separate Mascara for a few months now and have really liked it so thought i'd give this one a try as it has better reviews online. I've just tried it and I'm quite impressed, no clumping and easy to apply, it has a curved brush which I like, it makes it easier to reach the inner lashes. I got it in brown/black, but they do also do black but it was out of stock. I'm not too fussed about using brown/black as it doesn't make too much difference on my lashes. This was £5, and the Lash Extend and Separate is also £5, pretty good if you ask me, considering some of the drugstore brands are heading for £10 now. So i'm pretty happy with these as an alternative. Plus they are BUAV approved which is something I look for in new products. So there you go just a little nod to Marks and Spencer for their nice and non-bank busting products :).